“Read between the lines buffs” will have a field day with a new report out from law enforcement with regard to the Boston Marathon Bombings. Like almost everything else about this case, it suggests to the careful reader that much has been omitted. Not only is the report of interest, but so is its timing. The authorities deliberately delayed releasing it as long as possible—and have done so now that the trial is a done deal. 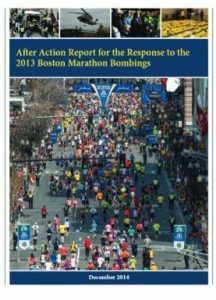 Partially explained shootouts, illogical timelines and omissions of significance make the “After Action Report for the Response to the 2013 Boston Marathon Bombings” yet another troubling aspect of the trial of convicted bomber Dzhokhar Tsarnaev. By intent, the report does not include an assessment of the criminal investigation of the bombing, nor does it include intelligence-sharing activities before, during or after the events. The events it does describe are incomplete. The main thing it does is mix praise with criticism as to how things might be better handled in the future. But it is far less intriguing for the things it says than those it does not say. In addressing how Transit Officer Richard Donohue Jr. was injured during the famed “Watertown shootout” with the Tsarnaev brothers, the report blatantly punts as to culpability, although it is generally agreed Donohue was shot by another officer, not by the suspects. Though he almost certainly did not actually pull the trigger that injured Donohue, one of the charges upon which Dzhokhar Tsarnaev was convicted Wednesday was injuring the officer. He can legally be charged with such because his alleged actions are what put Donohue on duty at the Watertown scene. And despite labeling the Donohue section of the report “Lack of Weapons Discipline,” the report does not explicitly resolve which officer or agency actually shot and nearly killed Donohue. This means that whoever showed that dangerous “lack of discipline” may not be held accountable or even necessarily given remedial training to avoid such mishaps in the future. This isn’t the only incident involving questionable actions of Boston law enforcement during the incident that the report fails to address. The report does cite some transgressions on the part of law enforcement, but doesn’t fully explain why or how some of these occurred. But that’s all the report makes of this seemingly “mistaken” incident of cop-on-cop gunfire. During Tsarnaev’s trial, his defense attempted to get more information about these other shootings, but was denied access to critical documents by trial court Judge George A. O’Toole. Prosecutors successfully argued that such information was immaterial to the case. It sounds like a scene from a movie: jittery officers unleash a barrage at a stationary target, and later, chagrined, discover that whoever was inside was not armed. But given that this mob-style thwacking came just hours after a fellow police officer had been killed by unknown assailants, many have wondered if this overkill was truly accidental. Unsurprisingly, the report does not enlighten. It merely decries purported errors, and suggests that the officers receive more weapons training. It does recommend a broader interagency meeting to discuss how to prevent the kind of officer “self-deployment” that resulted in Donohue’s injury. WhoWhatWhy has previously reported inconsistencies in the narrative provided by Dun “Danny” Meng, the man who said he was carjacked by the brothers. Those inconsistencies, like others, raise serious questions about how ruthless and focused the Tsarnaevs were—and even whether they may have left their purported victim alone in a car, making his escape easy. The After Action Report only deepens the mystery about what actually transpired. The time of the carjacking is listed in the report as11:20 p.m. But that is impossible, because a Bank of America surveillance camera caught Tamerlan withdrawing money from Meng’s checking account at…11:18pm—two minutes before the carjacking had purportedly even begun, a distance away. Not only is when of the actual carjacking occurred still in question, but where as well. Law enforcement in varying forums cited three separate locations: Richie’s Shell at 1001 Cambridge Street (Boston Police scanner), in the vicinity of Third Street in Cambridge and at 60 Brighton Avenue in Allston. The prosecution eventually settled on the Allston location during the trial, but the report made no attempt to address these discrepancies. Finally, the report also entirely fails to mention a peculiar incident that unfolded at the John J. Moakley Federal Courthouse on Wednesday, April 17, two days after the bombings. This event still has journalists buzzing, albeit privately. David Boeri, a reporter for the local public radio station WBUR, was, along with CNN’s John King, among several journalists who reported that day on a supposed arrest in connection to the bombing. Their reports were based on information received from judges and courthouse staff. Boeri reported that he had gone to the federal courthouse after being told an arrest had been made. He’d been told by two senior judges and other officials that they had been ordered to prepare courtrooms for a hearing in connection to the bombing. The following morning the courthouse opened as usual, and it was as if no purported arrests had ever taken place. The After Action Report does not enlighten us on this rather substantial error. And so the 60-page document becomes yet another question mark in a mountain of mysteries. Additional reporting help from Jill Vaglica.